Select EB Series Ball Valves for your application. Download the EB Ball Valves catalog. Flow Patterns: 2-way, 3-way, and angle. Orifices: 0.093, 0.125, 0.187, 0.281, and 0.406 in. SSP can provide three tube fitting designs for all FloLok valves without changing the end-to-end dimensions of the valve. Use the designators below to indicate the required design. Select the valve body material from the table below then add the designator to the basic part number. The downstream port vents to atmosphere through a vent hole in the side of the valve body when the valve is closed. The bottom port vents to atmosphere through a vent hole in the side of the valve body when the valve is closed. The pressure rating for vented valves is 500 psig (34.4 bar). To order vented valves, add V after the flow pattern designator. To prevent cross-vent flow, order a vented valve with a smaller vent orifice. Add the designator from the table below to the part number. EB Series ball valves are available with oxygen compatible lubricant and with no lubrication. To specify special cleaning, add the designator from the table below to the part number. Note: Valves with no lubrication have a pressure rating of 500 psig (34.4 bar). Valves with oxygen compatible lubrication are rated to -30°F. EB Series ball valves are available with special flow paths to accommodate sampling, draining, purging, tee flow and other applications. 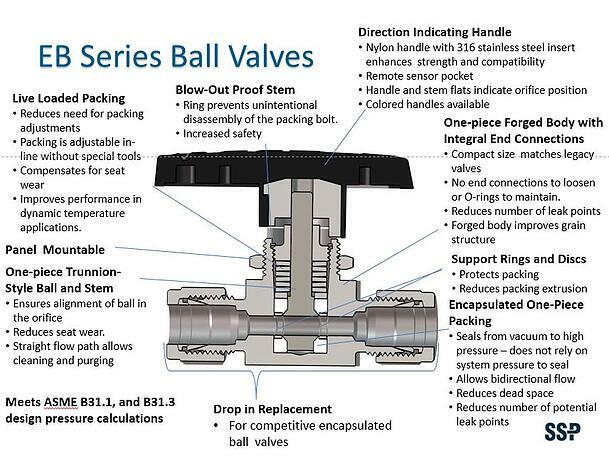 See the EB Ball Valves Catalog for additional information. 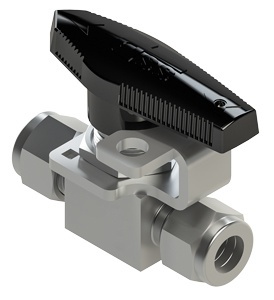 Stainless steel reinforced black nylon handles are standard on EB Series ball valves. To select a handle color, add the designator from the table below to the basic part number. Locking devices for EB Series ball valves are available for both 2-way and 3-way ball valves. 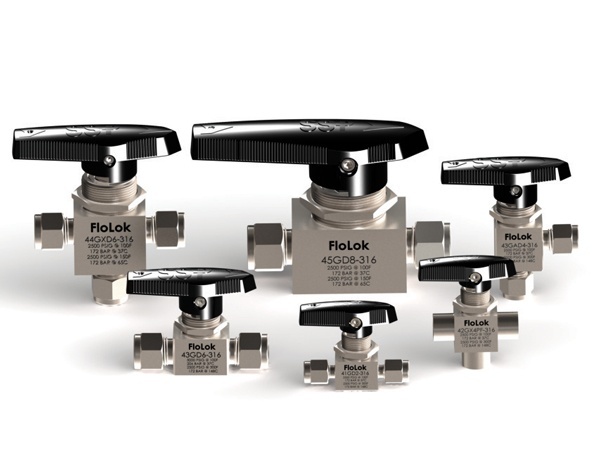 Compact locking devices are available for 2-way 42, 43 and 45 Series valves. To order standard locking devices add -LD to the part number. For compact devices add -LD2 to the part number. Example: 43GD6-316-LD. To order locking device kits for installation, see the EB Series ball valves catalog.